Marfa, Texas is the epicenter of cool. An unintentional mix of European charm, Los Angeles ease and New York City swagger, it's become quite the hot spot for people all around the world with an adventurous spirit. 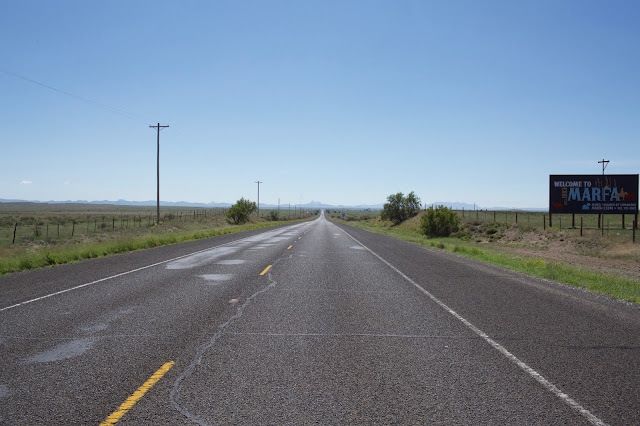 Located about 60 miles north of the Mexico border, it's home to right around 2,000 residents (several who recently relocated to Marfa within the last few years) and exactly one stoplight. 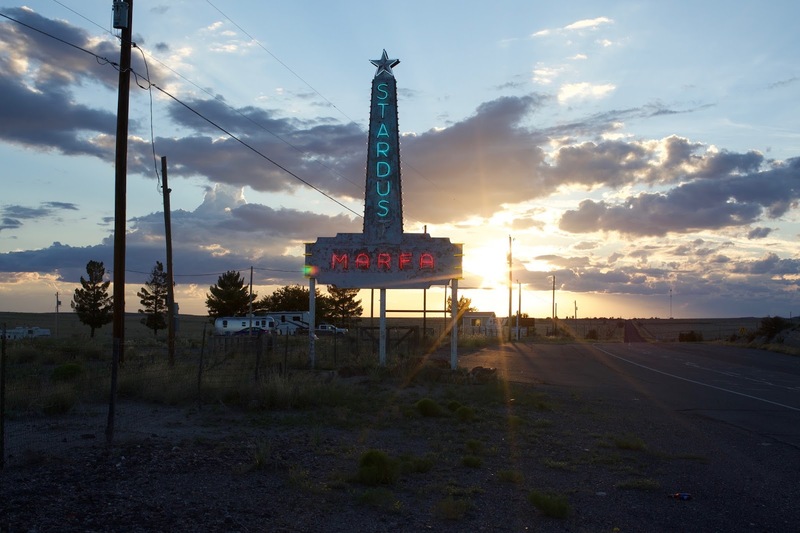 Aside from the meritorious culture, Marfa is also known for its many famous art installations. The Chinati Foundation, founded by artist Donald Judd, is a contemporary art museum with indoor and outdoor installations. 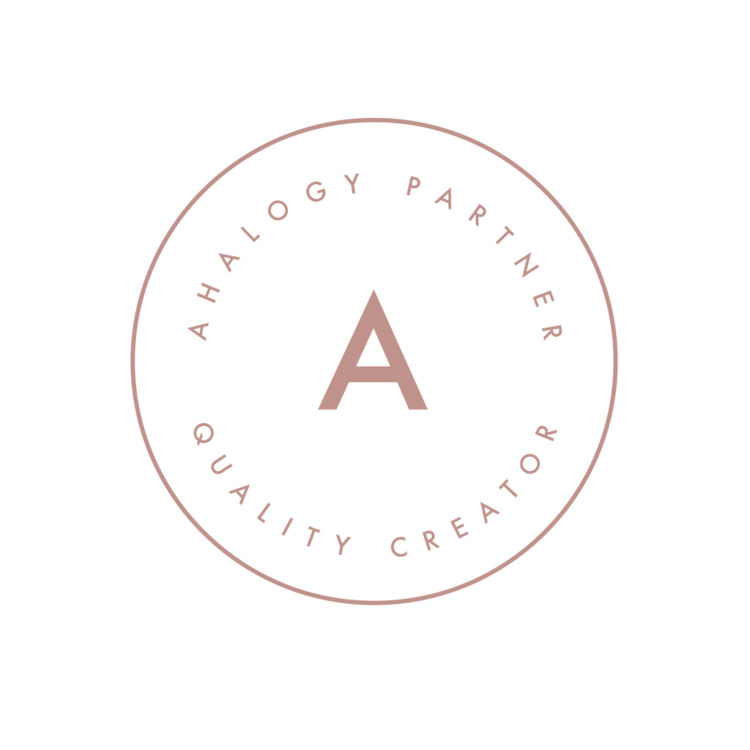 You may recall Solange Knowles performing at the 15 untitled works in concrete back in October in a beautiful bright pink gown. If not, Google it right now. Ballroom Marfa, an art center that greets you right as you pull into town, hosts concerts, exhibitions and an annual music festival in the spring, called Marfa Myths. Speaking of music festivals, Marfa is also home to the annual (bucket list-worthy) Trans Pecos music festival in the fall. And about 30 miles northwest of Marfa is a little installation you may have heard of before called Prada Marfa. Marfa is in the middle of nowhere. Let's just get that out there. It's about 3 hours away from the nearest airport and just over 20 miles away from the nearest town. Coming from Oklahoma City, we had a 9-hour trek on our hands, but we made it adventurous by stopping at some cool locations along the way - like Cadillac Ranch and Sandhills State Park. I stumbled upon El Cosmico (which then led me to discover the entire town of Marfa) just over 6 years ago and I haven't been able to shake the desire to visit since. 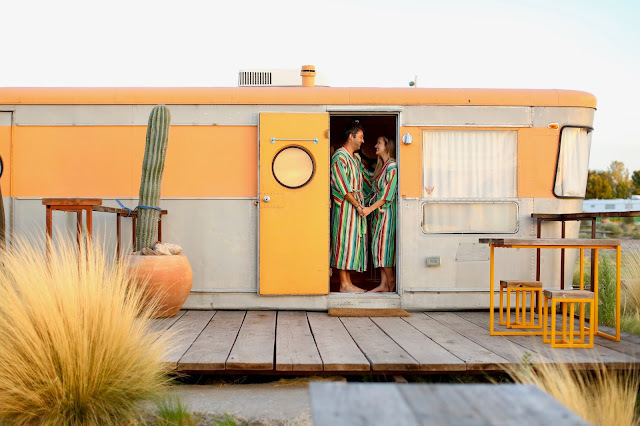 El Cosmico is an Instagram-worthy campground filled with decorated airstream trailers, teepees, yurts and hammocks. Staying at El Cosmico was a no-brainer for us. We wanted the complete Marfa experience, and this absolutely delivered it. Read more about our full experience at El Cosmico here. 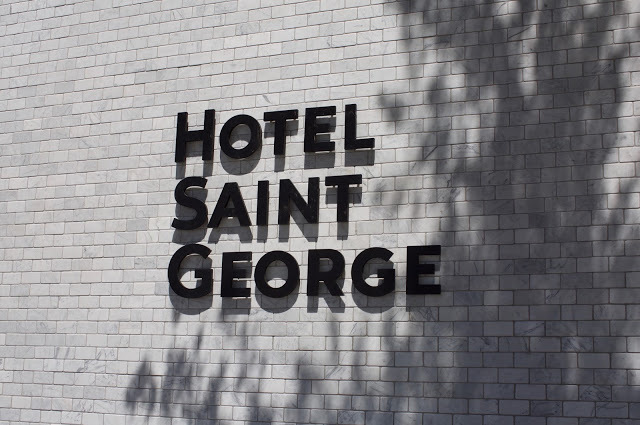 After two nights in our beautiful tangerine airstream, we opted for a completely different experience at Marfa Saint George, one of the two upscale hotels in town. Marfa Saint George was exquisite in every sense of the word. The rooms were an interior designer's dream and the amenities were unreal. The restaurant on the first floor, LaVenture, was phenomenal. While Scott and I agree that we could've stayed at El Cosmico the entire trip, it was so nice to spend our last night in town feeling completely pampered. It was also pouring rain, so it was nice to be indoors with so many options. Read more about our time at Marfa Saint George here. Finding food in Marfa can be tricky if you don't know where to look - and when. Some spots are only open on the weekends and some have very unique hours so be sure to google! Also know that you may have the same server at two different restaurants. I'm not kidding when I say that the town is really small - so be nice and tip well! Bun's and Roses is a cute mom-and-pop breakfast spot on the west side of town that serves traditional breakfast and fresh coffee with endless refills. They also have huge donuts that Scott and I just couldn't resist. We stopped here on our way out to Prada Marfa. 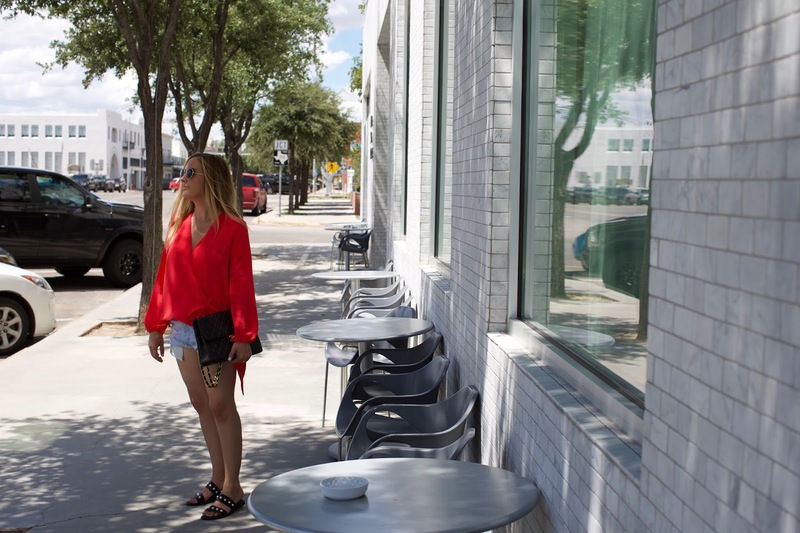 If you're into green juices and acai bowls, you have to try Squeeze Marfa. It's a very European and very quaint spot in downtown Marfa. Aside from healthy treats, they make a mean almond milk latte that'll really jazz you up. Bring your camera too because there are a ton of photo ops around! If you're looking for an authentic meal while you're this far south, Marfa Burrito is it. It's a hidden gem that is deeply loved by locals and everything is homemade right there in front of you - even the tortillas! The menu is simple and the atmosphere is something to experience. Don't forget to bring cash. The most popular food truck in all of West Texas (I'm probably making this up) is Food Shark. It's only open for lunch Wednesdays - Saturdays from 12-3. The first time Scott and I went, the wait was over an hour, so we decided to go elsewhere. The next day, we were determined to eat there and we did. We arrived right around 12:30 and waited about 45 minutes for our food, but we killed the time with delicious Mexican beer and good conversation. I'm telling you, IT WAS WORTH EVERY SECOND. Scott and I are still talking about it to this day. We stopped at Jett's Grill, an indoor/outdoor bar and grill located inside Hotel Paisano, the night we got into town. It is straight out of a movie scene and absolutely worth the stop. The margarita's are killer and they are best enjoyed on the garden partio at sunset. My favorite restaurant in Marfa was probably Stellina. It's very European in how it's laid out - you literally sit at a giant rectangular table with strangers that become friends by the nights end. The food was fresh, healthy and so delicious - and the wine selection was on point. Located just across the street from the Thunderbird Hotel is The Capri, a bar and restaurant with jaw-dropping interiors. We're talking floor to ceiling velvet curtains and one of the most picturesque bars I've ever seen. We stopped there Saturday afternoon for drinks and had an absolute blast. The bartender was a college student in a neighboring town and he told us all about Marfa, how legitimate Marfa Lights are and introduced us to all of the staff. I also had the best margarita of my life here. Perfect for a low-lit romantic dinner, LaVenture is an upscale restaurant located inside Hotel Saint George. It's a little pricey but definitely worth it for the food, drinks and atmosphere. The bar menu is super creative, so be sure to try something new! If you want to get in touch with your college years and enjoy a pint of beer, visit Planet Marfa. It's an outdoor-ish bar with ping-pong tables, an underground teepee and a lot of Marfa history. Next to Hotel Saint George is Bar Saint George, a private outdoor bar situated next to a beautiful pool and a long line of cabanas. They have a delicious frosé, but even better than that is their frozen prickly pear margarita. You cannot leave Marfa without trying it. You just can't. When you get to Marfa, the high desert ease will overcome you. Time moves slower. You'll spend more time having good conversations and less time thinking about your iPhone. It's an intoxicating environment and one that you surely won't forget. The uber-popular permanent art sculpture is located 30 miles northwest of Marfa in Valentine, Texas. I read that dawn and dusk were the best times to visit, which almost deterred us from going when we did since we slept in a bit, but we were really happy with our mid-morning adventure. We arrived around 10:30 and stayed until noon. We had the whole place to ourselves, aside from a few semi-trucks, for the majority of the time. Read more about our trip to Prada Marfa here. Twenty minutes east of Marfa, in a town called Alpine, is Big Bend Brewery. It's open to the public and the beer is ridiculously delicious. Scott and I each grabbed a pint and sat on the back patio while we watched a thunderstorm roll by in the distance. Behind us, families were playing card games and dancing with their toddlers. It was a very cool experience and worth short drive. One thing you may not know about me is that I am all about extraterrestrials. If there is a UFO documentary on TV, you better believe I'm watching it from start to finish. 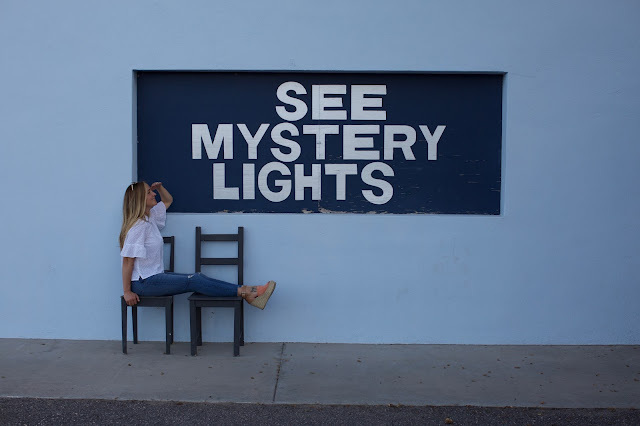 So one thing I was so excited to do while in Marfa was watch for the illustrious Marfa Lights. There is an outpost just east of town where there have been documented sightings and you can sit out there for as long as you want. If you do, bring a drink! Two more things that we wish we could've experienced were hiking at Big Bend National Park and exploring the Chinati Foundation and Ballroom Marfa. We had them on our list, but we ultimately got caught up in each other's company over drinks and I'd take anyday. For the record, we tried to visit Ballroom Marfa but they were closed for an install. Then we caught in a downpour walking back to our hotel and we couldn't stop laughing about it. I blame all of the margaritas. 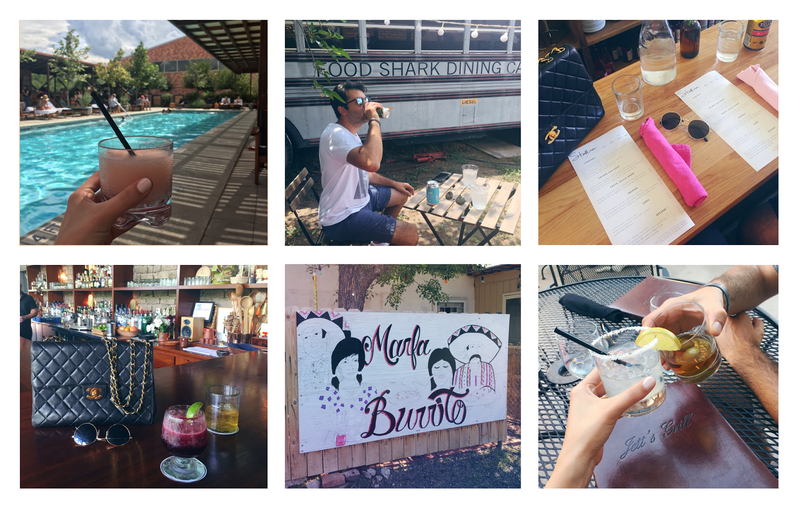 Our trip to Marfa was everything we wanted it to be. We chose this destination for our first solo trip away from the kids because we knew it would be laid back. We wanted to go somewhere where we could learn and explore, but ultimately, we didn't want the distractions to take away from the quality time we wanted to spend together. And now we can't wait to go back!